It's well known that the Stampede is synonymous with rodeo, cowboys, and a celebration of Western Canadian culture. But besides the rodeo and chuckwagon events, there are also a huge midway, live music shows, and cultural and festival events. The festivities spill across the entire city, so if you're in Calgary for more than a day or two, make sure to check for events off-site too. The last time I went to the Calgary Stampede, I was nine years old. I'm excited that I finally get to go back this year. I've been planning a lot already, and it seems like that's for the best, as accommodations and events book up quickly. The Stampede grounds are located at the southeast end of downtown Calgary. They're in easy walking distance of downtown hotels (if you have that kind of money to spend). If you're staying in more economical accommodations further away from Stampede Park, use the CTrain, which will also help to avoid parking hassles. A day pass for the train will remain usable until 4:00 am the following day. CTrains run 24 hours a day during the Stampede. Stampede Park opens at 8:00 am daily, but most things don't get under way until 11:00 am. Tickets to enter the park are available right at the gate. Ticket prices for 2017 are advertised as $18 for adults and $9 for seniors (65+) and kids (7-12). Children aged six and under get in free. The Stampede also has Value Days, which offer discounted or free admission to selected groups (like seniors and kids) on different days. These Boots are Made for Walking: Be Comfy! The Stampede is huge and it can be overwhelming. 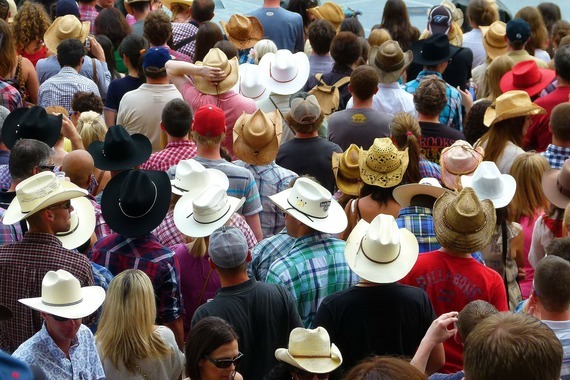 Well over one million people will visit Stampede Park during the ten days that it's on. To put that into perspective, the daily average of 120,000 Stampede-goers is more than double that of Walt Disney World, which has 53,000 people visiting each day. If you can, planning a two-day visit is best. But whether you cram everything into one long day or have a more leisurely two days, a little advance planning will help keep you comfy, hydrated, and blister-free. While there are some indoor venues, you'll be outside most of the time. The official Stampede website suggests planning for a daily high of 23C (73F) and an overnight low of 9C (49F), but it's not unusual for daily highs to soar above 30C (about 86-96F). And it's always a good idea to check the forecast in case you'll need rain gear later on. Whether you wear full western gear or something cooler, make sure to take along sunscreen. If you're planning to stay into the late evening hours, take a light jacket or sweater too. Choose comfortable footwear. You'll be doing a lot of walking. It may be tempting to splurge on a pair of cowboy boots to fit in with the Cowtown atmosphere. But, as someone who has broken in several pairs of western boots, let me tell ya: you do not want to put a brand-new pair of boots on and then walk around in them all day. Most park vendors accept cash only. There are some ATMs (automated bank machines) on site if you run short, but be prepared for lineups. American cash is usually accepted at the appropriate exchange rates. Outside the park, most stores and businesses accept credit cards and some will accept traveller's cheques. Expect fair food at the park: candy apples, snow cones, and deep fried everything. Highlights from 2016 include deep fried butter tarts, apple pie ice cream sandwiches, and teriyaki chicken perogies. To kick-start your day (and because there just aren't enough calories in deep fried butter tarts), visit one of the many free pancake breakfasts around the city. To save a little money and be a good environmentalist, lug a water bottle. You'll be walking a lot, in warm weather, at high altitudes. You need to stay hydrated. Use the Stampede schedule to plan your day in advance. 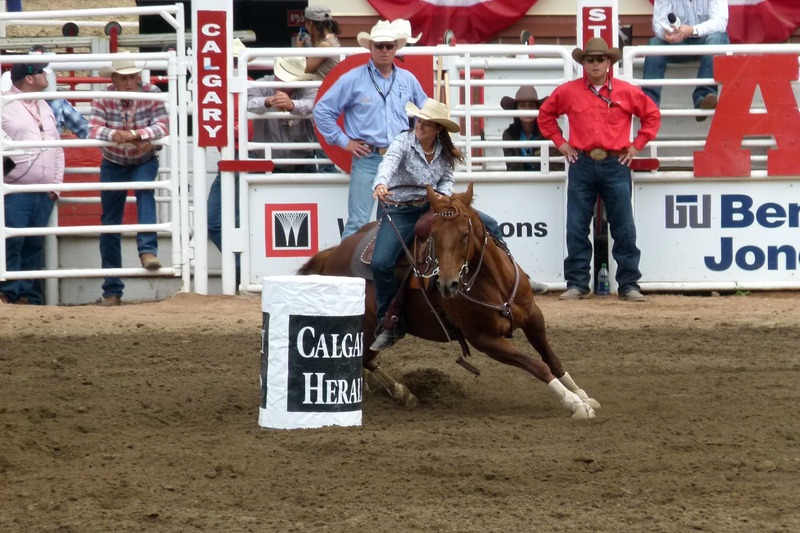 If you buy tickets to the rodeo, chuckwagon races, grandstand show, or a concert on the grounds, that ticket price includes admission to the Stampede itself. If you only need admission tickets, you can buy those in advance too, at the official Calgary Stampede website. There is a $1 fee to do so, but it will save you time at the gates. During the Stampede, Calgary hosts an amazing variety of musical acts. There are numerous live concerts every day at various venues right on Stampede grounds. At the time of writing, Alabama, Johnny Reid, and the Chainsmokers are confirmed to be playing at the 2017 Stampede. There are several big shows off-site as well. The Stampede Roundup, booked at Shaw Millennium Park this year, has had past headliners as diverse as Journey, Def Leppard, and Kiss. At the Rotary's Oxford Stomp, held at Fort Calgary, past performers have included Don Henley, Sheryl Crow, and Blue Rodeo. This year, Corey Hart is confirmed to be headlining off-site. After a day spent wearing practical clothing and trudging around the Stampede grounds, the live shows are a chance to get down and party with 20,000 new friends. Don't be afraid to let your western gear take on more a club feel as night time approaches. Check out websites like 3wishes.com for inspiration. Dressing up in western gear is all part of the fun. As Steven Spatola, Vice President of 3Wishes says, "The Stampede is the perfect place to check out both amateur and professional western costumes that harken back to a simpler era. If you've always been interested in the Old West, taking a close look at the vast array of costumes you'll see will give you an even greater appreciation of cowboy culture. Then, if you're brave, you can create your own and see how you stack up against other cultural aficionados."